Bad things only happen to other people in other places, right? You know, like the places you see on the news, but not in places like your neighborhood and certainly on your street. Right? If it something did happen on your street all you have to do is call 911 and someone will swoop in and save you. Right? Well, no, not really. You will almost certainly experience a disaster in your lifetime. Nearly 1.7 billion people have been affected by a disaster in the last 10 years alone according to a recent study. If you think it is super-duper hard or super-duper expensive to prepare then, I’m sorry, that’s not really true either. It is, however, a little more difficult and a little more expensive than avoiding preparedness. So, let’s assume the person reading this is interested and willing to be just a little more prepared than many others. And let’s assume that person is preparing a family of four for a mild to moderate disaster. Here are three simple steps you MUST take today to be prepared. First, for the sake of argument, a mild disaster is something that lasts 1-2 days and a moderate disaster is one that lasts 3-5 days after which everything returns to complete normalcy. That way we are all on the same page. Secondly, we will begin as if we are talking to someone who is 0% prepared. 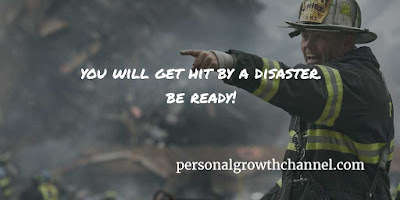 Finally, we do not claim this will save your life or some other person’s life simply because you have read this, but that if you commit to becoming prepared for disaster then your odds have improved. Take a CPR & First Aid class with the American Red Cross. Afterwards, go to your favorite dollar or overstock store and purchase some basic first aid items. Gauze, bandages, tape, antiseptic wipes, etc. It will cost very little if you shop at those places. You can also buy prepackaged kits, although these are usually a little more expensive. If you do nothing else written here, you MUST have water stockpiled. You need at least one gallon per person per day for drinking. In this case we are talking 8 to 20 gallons. You can either buy that quantity in drinking bottles or in one-gallon jugs. It will be less expensive to purchase 5-gallon containers like what you see in office water coolers. It is a good idea to have water for sanitation too. Without going into too much detail, if the sewer service stops you can flush the toilet by pouring water into the toilet bowl. But you don’t want to use your drinking water for that. My recommendation is to purchase five or six 5-gallon buckets & lids at Wally-world for $4 each and fill them with tap water and set them aside for that purpose. Eventually you might want to look into an emergency water filter, but you won’t be able to get that at the one-buck store. A lot of people think emergency food storage means having half a ton of rice, dry beans, and oatmeal. Nothing is further from the truth. Actually, I’m telling you right now do not buy any of that stuff. If there is no electricity how would you cook that stuff? Maybe on your BBQ grill. If you live in an apartment that may not even be an option. Think canned goods. Stuff you can eat without cooking. Even if it would be your preference to eat it hot, consider it if you could eat it cold. Things like canned chicken and/or tuna, canned pastas, canned veggies, canned beans, canned potatoes. You get the idea. A good beginning goal is to have four cans of food per person per day; 8-20 cans. Oh, and, remember you need a manual can opener. You need a place to put all that stuff. I get it. I really do. You may not have much room where you live even if you do have the time and the money to collect all that. That is a legitimate argument. If it happens that you truly cannot follow these three steps for one reason or another then you absolutely must have a bug-out bag. But that is a topic for another article. Take care, y’all, and God bless. About the author: Richard Davis is a retired veteran with a degree in Emergency Management on a mission to encourage people and communities to be prepared for emergencies by demonstrating low cost and low effort ways to be stay safe. His holistic approach includes physical, mental, social, and spiritual needs during a disaster. If you have the basics down but want to go further, check out http://reddit.com/r/preppers for a community dedicated to being prepared before it is too late! Next in our series: Get Home Bag: Are you prepared to make it home when disaster strikes? Like the article? Don't forget to share and sign up for our newsletter so you don't miss the next one!